A different perspective on a well photographed train. 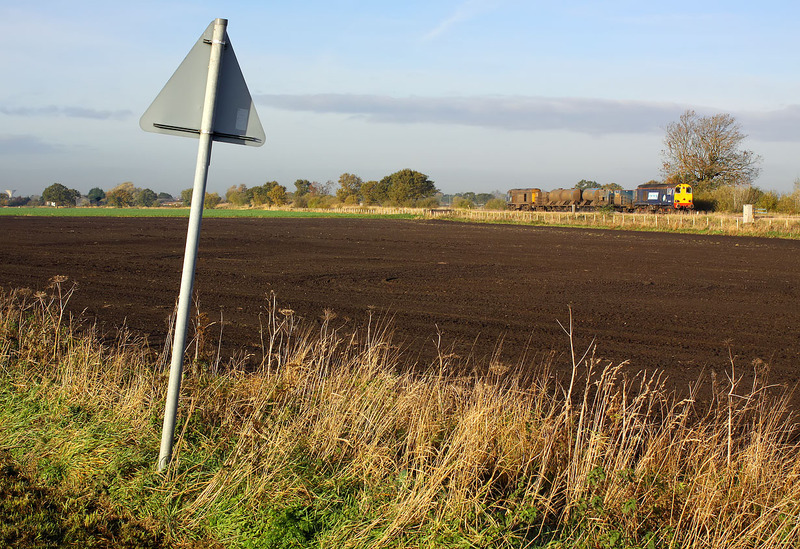 Rather than go for the standard trackside shot of the 3S13 08:50 Wrenthorpe to Grimsby Town Rail Head Treatment Train on 13 November 2013, I opted for a 'train in the landscape' type picture. With a road sign providing foreground depth, 20312 leads the train past Maud's Bridge, with 20302 bringing up the rear. I particularly like the way the dark ploughed field contrasts with the dead grass in the foreground. The distinctive concrete water tower at Thorne can just be seen on the extreme left. I am always a little apprehensive when attempting these arty shots, but I think this one seems to have worked!